Olive-sided Flycatcher (Contopus cooperi) is a medium-sized tyrant flycatcher (family Tyrannidae) but a large “flycatcher” as that common name is applied. Only Great-crested Flycatcher is larger. It has the longest migration of any North American flycatcher. Breeding grounds are the Rocky and Cascade Mountains from Texas to Alaska, across Canada and the northern border states to Newfoundland and Vermont. 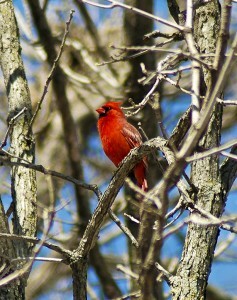 In Minnesota the breeding range includes the northeast third of the state. Wintering grounds are mostly in Panama and the northern Andes Mountains from northern Venezuela to western Bolivia. Olive-sided Flycatcher is the only North American flycatcher to feed exclusively on insects caught in flight. When feeding it perches at the top of a tree or on a dead branch, launching occasionally to catch a flying insect in the air, and returning often to the same perch. Small insects are consumed in the air. Larger insects returned to and beaten against the perch to subdue. 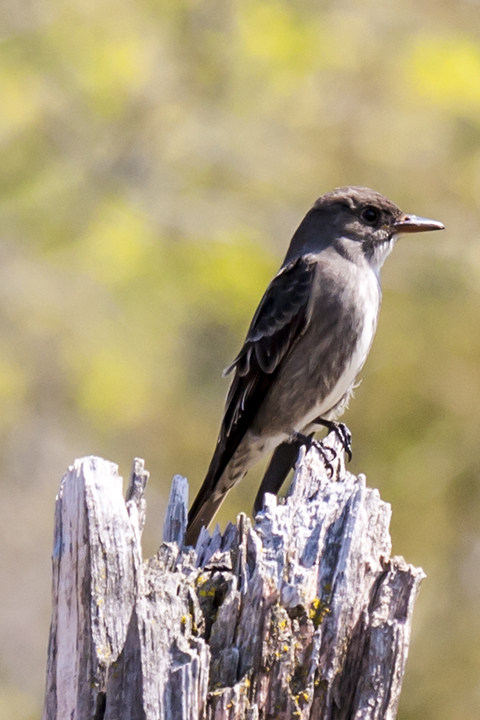 Flycatchers are notoriously difficult to identify by plumage alone. Olive-sided Flycatcher is one exception to this rule. It is easily identified by its white breast and contrasting dark “vest”. It is further distinguished by its large size; indistinct pale wing bars; whitish undertail coverts with well-defined, dark, V-shaped markings; and inconspicuous eye ring. This entry was posted in Birds and tagged Contopus cooperi, Olive-sided Flycatcher on November 16, 2015 by John Valo. 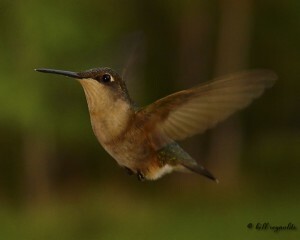 Ruby-throated Hummingbird (Archilochus colubris) is the smallest breeding bird in the eastern United States and southeastern Canada. It is seldom seen but easily recognized because it is the only hummingbird that breeds in or migrates through Minnesota. 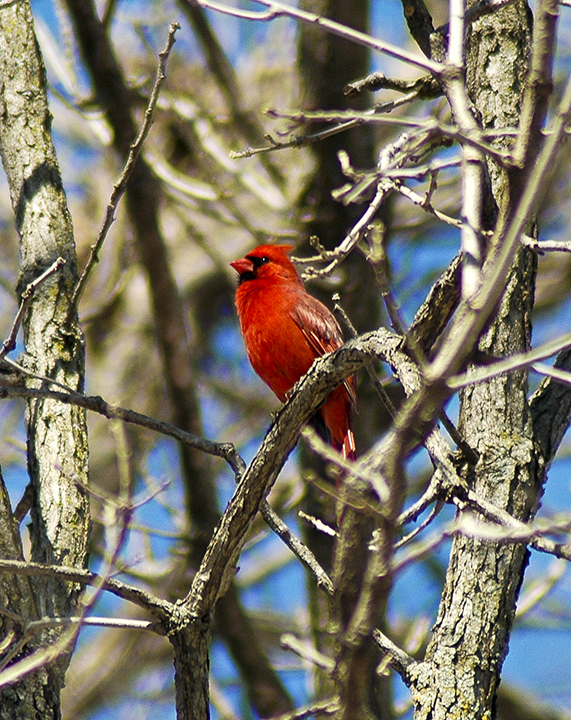 It is a migratory bird, arriving in Minnesota in late April and early May. It is a solitary breeder—after mating the male has nothing more to do with the female or its offspring. In the fall, adults migrate across the Gulf of Mexico or along the western coast of Mexico to Central or South America. This entry was posted in Birds and tagged Archilochus colubris, Ruby-throated Hummingbird on February 19, 2014 by John Valo.